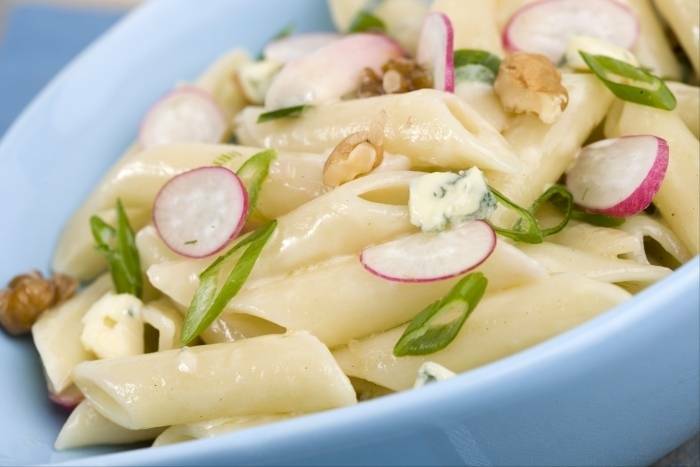 A delicious pasta dish with the rich flavours of blue cheese and walnut. Finely chop the spring onion. Halve the radishes. Cut the blue cheese into 1cm cubes. Bring a large quantity of salted water to the boil (about 10g of coarse salt per litre of water) and cook the pasta according to the time indicated on the packet (in general 10 to 12 minutes). Heat a frying pan, add a little butter and sauté the onions. Add the walnuts and radishes and cook for 2 minutes. Add the drained pasta, then add the blue cheese and mix gently to melt the cheese. Serve on hot plates.